In December 2015 I was invited to take part in a project which aimed to collect people’s memories of Loughborough and use them as a creative stimulus for making jewellery. The project was carried out by Roberta Bernabei, a lecturer in Contemporary Jewellery and Critical and Historical Studies at Loughborough University, whose creative pieces have been exhibited around the world. Wanting to encourage local participation in the arts, Roberta would take an unusual approach to preserving people’s memories – through the act of wearing jewellery. So on a sunny winter morning I visited Roberta’s office in LU Arts’ Edward Barnsley building on Epinal Way. 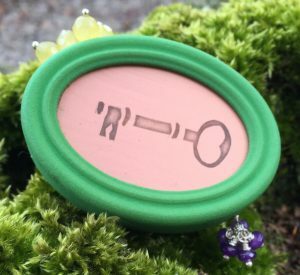 Roberta had asked me to bring along an image, photograph or object relating to a strong personal memory of the town and after some deliberation, I’d chosen a key. I’m a member of Loughborough Archaeological and Historical Society which runs the Old Rectory Museum in Steeple Row and the key is similar to the one we use to unlock its old wooden door. I chose it to symbolize my first visit to the museum one drizzly Saturday many years ago. Roberta took a photograph of the key and explained she’d be interpreting my memories in the form of a brooch. Then she switched on a digital recorder and invited me to tell her the memory associated with the key. As I talked, she prompted me with questions. What emotions were linked to the memory? I’d been looking for something to entertain a lively young child and my first feeling was relief at finding the museum open, followed by wonder at its ‘Old Curiosity Shop’ interior. It was packed to the rafters with furniture and pictures and old dusty artefacts and, most significantly, an ancient model railway which drew my son like a magnet. He played happily with it for quite some time, giving me leisure to listen to the old gentleman on duty tell stories of Loughborough in times gone by. Our discussion that day fuelled an interest in local history which would go on to have a significant impact on my life. Could I recall any particular colours? Roberta asked, and I suddenly thought of the leaves on the trees around the museum, bright green and dripping with rain. At the end of the interview I gave Roberta a book about the Old Rectory and she asked if I’d like to collect my brooch in person when it was done. I said that I would. On a Saturday in January 2016 I went along to the unit in Carillon Court Shopping Centre used by LU Arts’ Radar initiative for their ‘Market Town’ project. There I joined fellow interviewees to celebrate with tea and cake and to listen to Roberta describe her jewellery-making process. Roberta had created each brooch by etching a unique image into a plate – many of them copper – and setting it into a pre-formed coloured mount which ‘framed’ the memory. The brooches were embellished with beadwork to signify the colours, feelings and objects that people had recalled in their stories. Roberta Bernabei’s brooch based on a memory of the Old Rectory Museum in Loughborough. Altogether, Roberta had created ten brooches representing the diverse range of objects and memories participants had shared with her. One person had taken along a locally-printed book she’d enjoyed as a child. Another shared the memory of her wedding bouquet, made entirely from local flowers by a florist on Park Road. One brooch – created for the only man to take part in the project – was inspired by an enthusiasm for the Athletic Grounds which had once stood along Nottingham Road. The gentleman would, he told me, be gifting the brooch to his wife. As for my brooch, I pinned it to my scarf as I left the exhibition then I headed off to do some shopping. Within half an hour I’d bumped into a friend and told her all about the memory behind the image on the brooch. I’ve told people the story several times since. Before this, I never would have believed a piece of jewellery could hold a town’s history so effectively. I’m rather pleased to find that indeed it can. Here is the jewellery Roberta created for the Loughborough Jewels project.